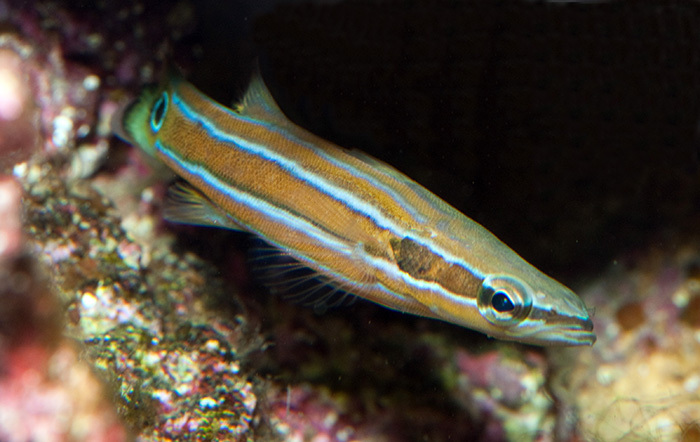 By Todd Gardner The flathead perch, Rainfordia opercularis, is a small colorful serranid from the coral reefs of eastern Australia. 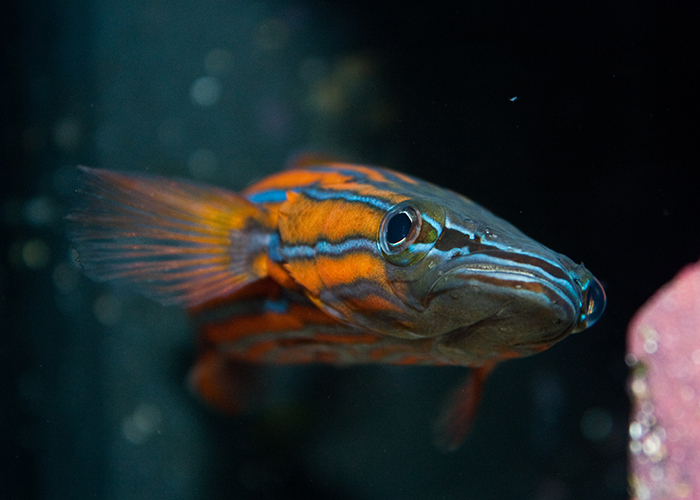 Due to its limited geographic range and elusive habits, this little bass is extraordinarily rare and expensive in the marine aquarium fish trade. The species has entered the US only a handful of times and typically retails for around $5000. R. opercularis is also relatively rare in museum collections and its DNA is poorly represented in databases. It was first described in 1923, at which time it was placed in its own family, Rainfordiidae. Today it is placed in the family serranidae along with groupers, basslets and Anthiines. It is the only member of its genus and is considered to be very closely related to the Liopropoma spp. with which it shares the tribe Liopropomini. The only published information on its larval development comes from two individual settlement-stage larvae collected in a light trap in Queensland in 1999 and documented in a 2007 paper by Baldwin and Leis. In 2011, the flathead perch was named the Reef Fish of the Year by Lemon TYK, despite the fact that very few reef keepers could ever hope to see one. Adult male flathead perch, Rainfordia opercularis. Photo by Todd Gardner. Last year, through the good will of an anonymous donor combined with the efforts of Fluid Dynamics International and Kevin Kohen at LiveAquaria, I was graced with the opportunity to obtain a pair of these incredible fish for my marine biology lab at Suffolk County Community College in Riverhead, NY. Although my aquaculture infrastructure was not quite ready for me to jump into larval rearing, I knew this pair had been in captivity for around five years, and with no information about their life span or reproductive life, I knew I needed to get started right away. I reported on my early attempts as well as the first brood to near metamorphosis at MACNA 2016 and in my article Back to Basslets in the last issue of Reefs Magazine. Now, as that first brood is reaching seven months post-hatch and approaching market size, I thought it was time for an update. General Broodstock Care and Egg Handling The adult pair is kept in a 120-gallon aquarium with a corner overflow, abundant live rock and a clean-up crew consisting of Turbo snails, assorted hermit crabs, sand-sifting sea stars and sea cucumbers. They are fed three times each day with Fish Frenzy and Fertility Frenzy from LRS, and live shore shrimp (Palaemonetes pugio). The lower overflow grate has been covered with a sheet of plastic in order to direct all water exiting the tank through the surface overflow. The MRC acrylic sump contains a refugium and a NYOS Quantum 160 protein skimmer. Water is circulated between the tank and sump with a Waveline 6000 DC pump. A Maxspect Gyre XF250, placed at the surface, directs surface water toward the overflow. A separate loop circulates water through two reactors containing PhosBan and activated carbon. All saltwater in all systems is maintained at 30ppt using synthetic salt mix from ESV. R. opercularis egg. Photo by Todd Gardner. 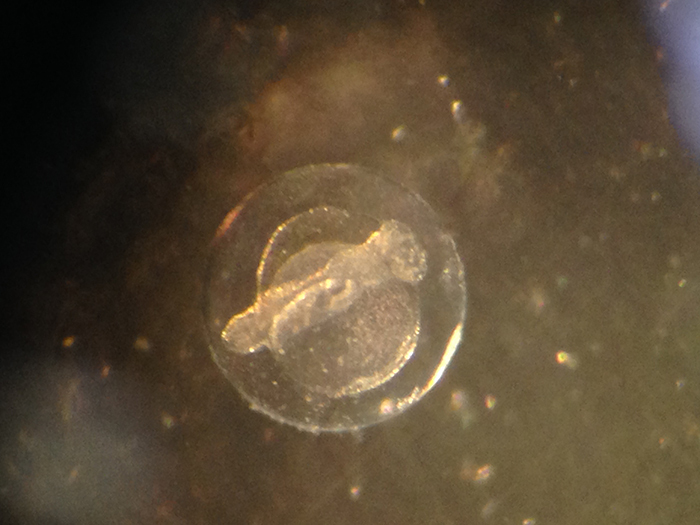 Newly-hatched R. opercularis prolarva. Photo by Todd Gardner. 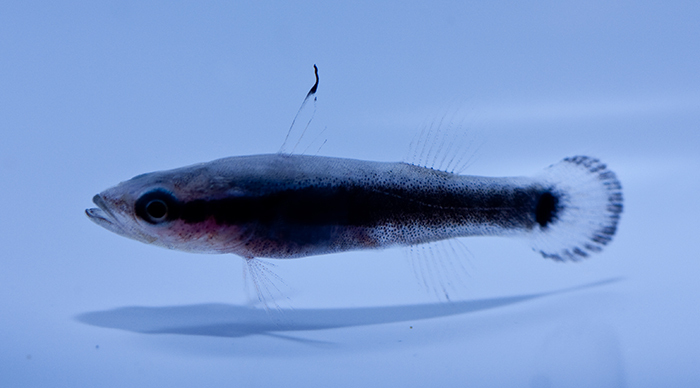 This is an account of the first and only successful rearing of R. opercularis to date. Time and space constraints in my lab, in addition to the long-term occupation of my only suitable rearing tank by this batch of larvae, have prevented me from attempting any successive broods. Approximately 1000 eggs collected on July 30, 2016, were placed directly into the rearing tank, a 60-gallon black fiberglass cylinder with a conical bottom. Temperature was maintained at 24◦C with an Eheim 75W aquarium heater. The eggs hatched into non-feeding prolarvae in less than 24 hours. For the first four days, no food was added and for the first five there was no water exchange. Four-day-old R. opercularis larva. Photo by Todd Gardner. 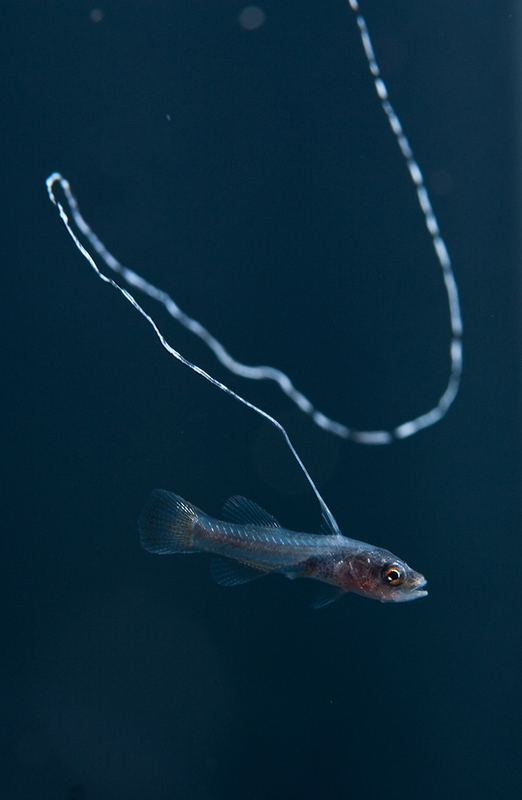 By 5dph (days post hatch), the characteristic dorsal filament was visible and larvae appeared to be hunting for food. At this time, copepods (Parvocalanus crassirostris from AlgaGen) and phytoplankton (Isochrysis and Tetraselmis) were added to the tank. Beginning on day 6, a very slow flow of water was circulated between the broodstock and rearing tanks in order to maintain water quality. I don’t consider this an ideal setup as hydroids and other encrusting invertebrates introduced from the broodstock tank can quickly become a problem in the plankton-rich environment of a rearing tank, but since the only space available was immediately adjacent to the broodstock tank, it was the simplest option for the time being. The flow was slowly increased over the duration of the larval period. Daily additions of phytoplankton were made for the first four weeks. A 40-micron mesh on the overflow prevented copepod nauplii from being flushed out. At weeks 2 and 4, the effluent screen was switched out for a 100 and 500-micron mesh, respectively. 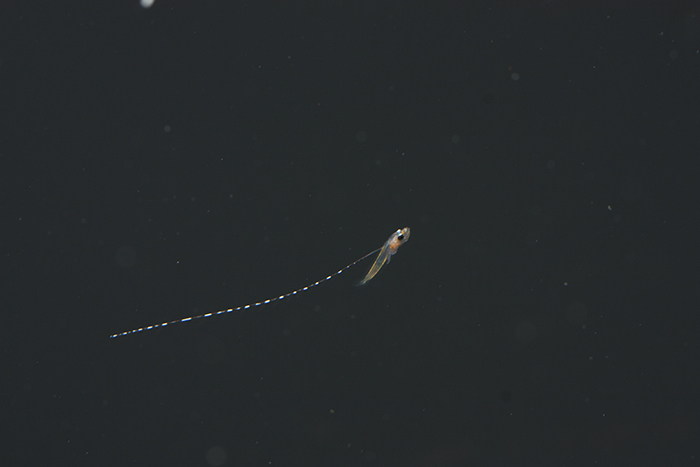 During week 2, the copepods Acartia tonsa and Pseudodiaptomus pelagicus (also from AlgaGen) were added to the larval diet. R. opercularis larva at 12dph. Photo by Todd Gardner. 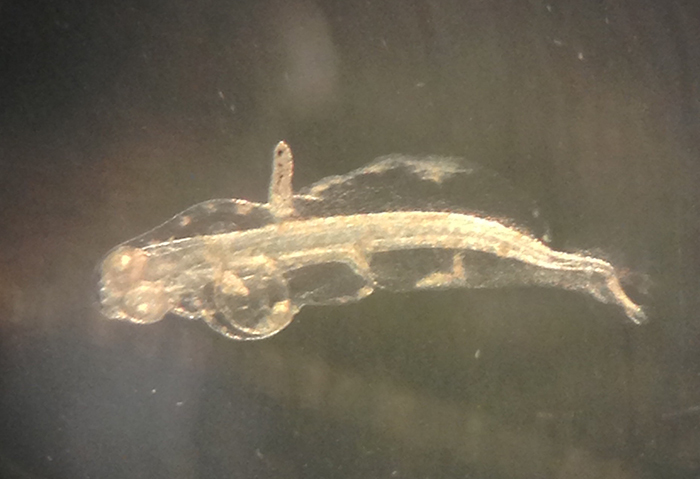 R. opercularis larva at 14dph. Photo by Todd Gardner. The larvae suffered steady mortality (a few each day) throughout the entire larval period with significant spikes centered around day 17 (flexion) and day 40 (the beginning of settlement). The dorsal filaments continued to elongate from day 4, until just before settlement, at which time the average length was about 20X the body length. At or around settlement, the filaments typically became entangled and broke off. R. opercularis larva at 35dph. Photo by Todd Gardner. Approximately 20 larvae settled between days 40 and 50. As each larva settled, it was carefully removed and placed in the refugium or in a separate 20-gallon glass tank with live rock. Post-settlement juveniles were brownish with a thick black lateral stripe and a black ocellus at the base of the caudal fin. By day 60, the black stripe was bordered with two thin, bluish white stripes in most of the juveniles. R. opercularis at 59dph. Photo by Todd Gardner. 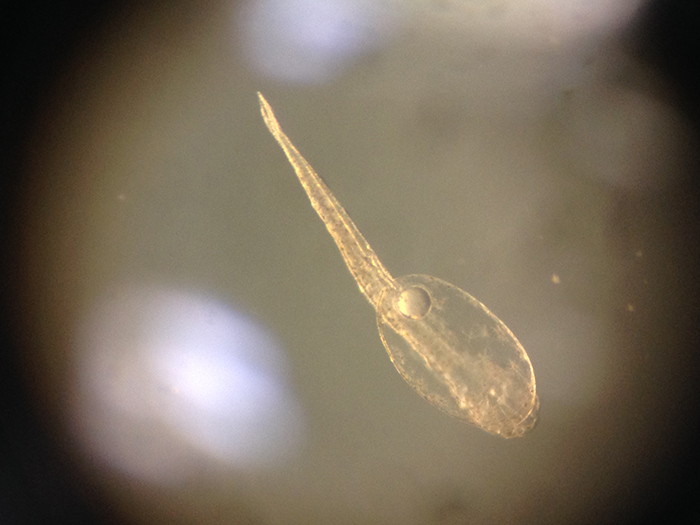 60-day-old R. opercularis postlarva. Photo by Todd Gardner. As of this writing, at 7 months old, the juveniles are 3-4cm in length and are progressing toward adult coloration more with each passing day. 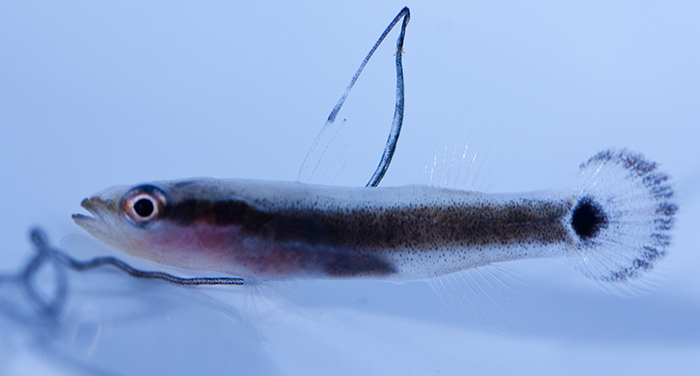 Currently, they are fed 4 times each day with a variety of frozen foods, including LRS Fish Frenzy and Hikari Mysis. 7-month-old R. opercularis. Photo by Todd Gardner. In the coming weeks, the first captive-bred Rainfordia opercularis will hit the world market, offered by Fluid Dynamics International, on behalf of the anonymous donor. Although neither my school nor myself can accept any money for these fish, their sale and this project will benefit our students in a number of ways. 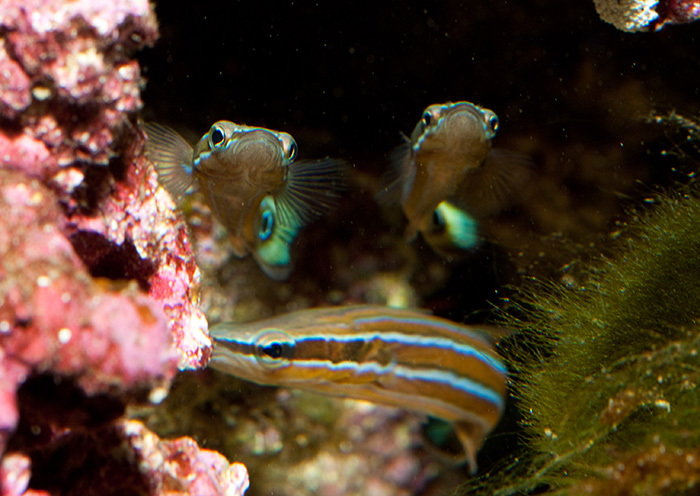 If the donor can profit from the fishes and equipment donated to the lab, it will help to ensure continued support. Our students have had the unique opportunity to watch, first hand, the complete development of a larva which was virtually unknown to science before this. 7-month-old R. opercularis ready for market. Photo by Todd Gardner. R. opercularis in growout tank. Photo by Todd Gardner. We have been able to illustrate beautiful examples of reproduction, development, mimicry and plankton ecology, right here in my classroom. It is now generally agreed that one of the primary functions of the extremely long dorsal filament throughout the larval period is the mimicry of deep-sea siphonophores. 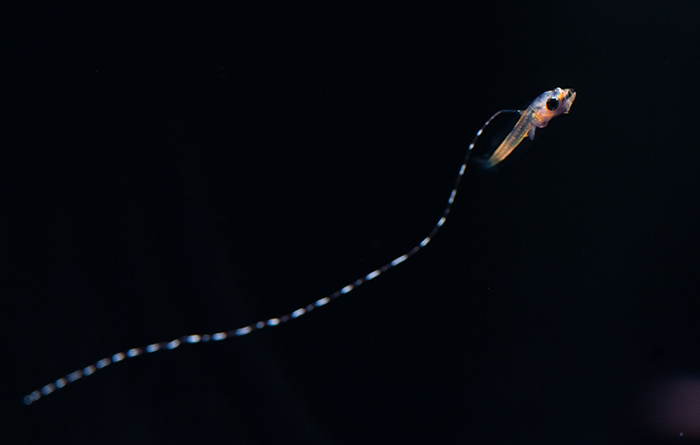 Our videos of live larvae trailing these filaments around their rearing tank have helped to confirm this. By preserving eggs and larvae at various stages, which were sent to the Smithsonian Institute, we have expanded the DNA collection for this species and provided material that will eventually be used to document its complete larval development. I don’t know what the price tag will be for these offspring, but I would suggest that they are more valuable than their wild-caught counterparts since they don’t carry the same risk of disease and parasites. Also, they represent only about 2% of the original spawn, so as a very small minority these survivors represent the first step in the domestication process. They have been selected for rearing in captive conditions. Pair of 7-month-old R. opercularis. Photo by Todd Gardner. As a commercial aquaculturist at C-Quest in the 1990s I watched the same process take place with the dottybacks (Pseudochromis spp.). We only achieved about 1% survivorship or less from the first generation out of the wild, but I had the privilege of seeing those rates significantly increase during my tenure there. 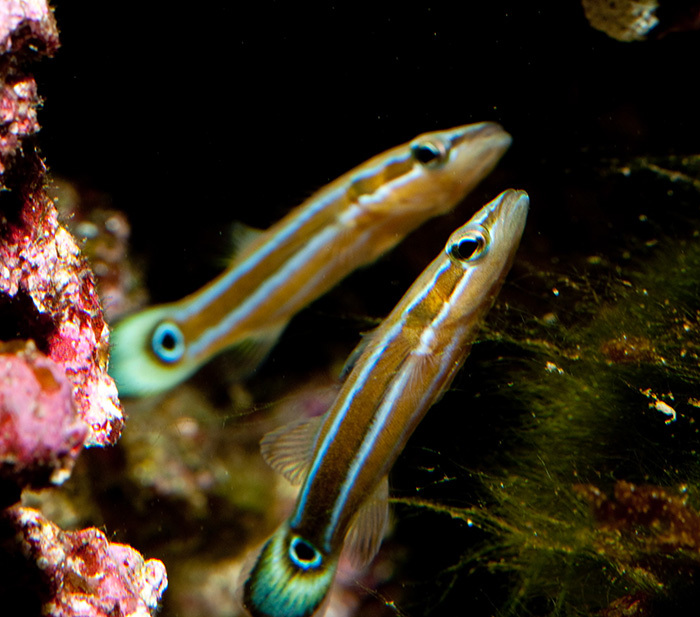 Today, fish breeders consider dottybacks to be one of the easiest families of fishes to raise in captivity. 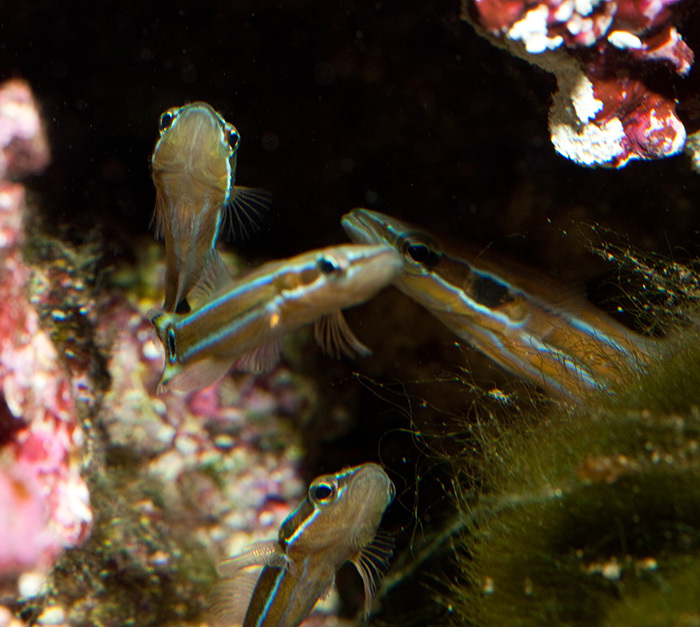 While technological advances undoubtedly play an important role, it is also worth considering that nearly all of the dottybacks in commercial production today are descended from those that were initially brought into the trade at C-Quest during the time when 1% survivorship was considered success. Reclusive R. opercularis juveniles in their growout tank. Photo by Todd Gardner. 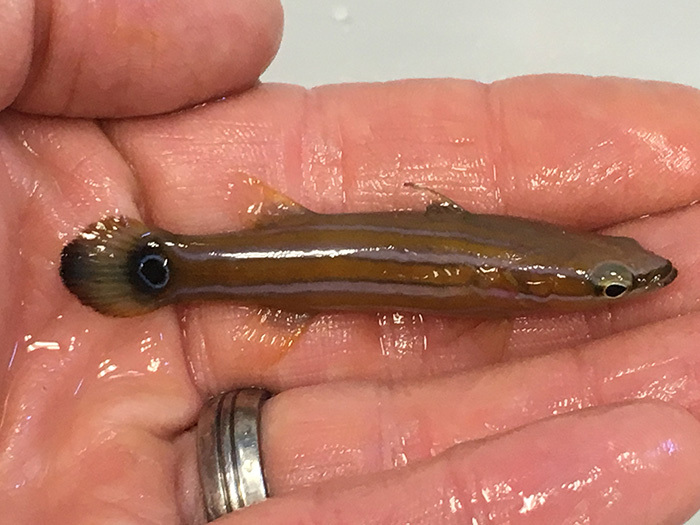 It should not be overlooked that with each generation these captive bred fish become better adapted for captive culture and better selected for an aquarium environment. I look forward to knowing these captive raised R. opercularis will thrive in home aquaria as we brace ourselves for another year of milestones in marine ornamental fish culture.